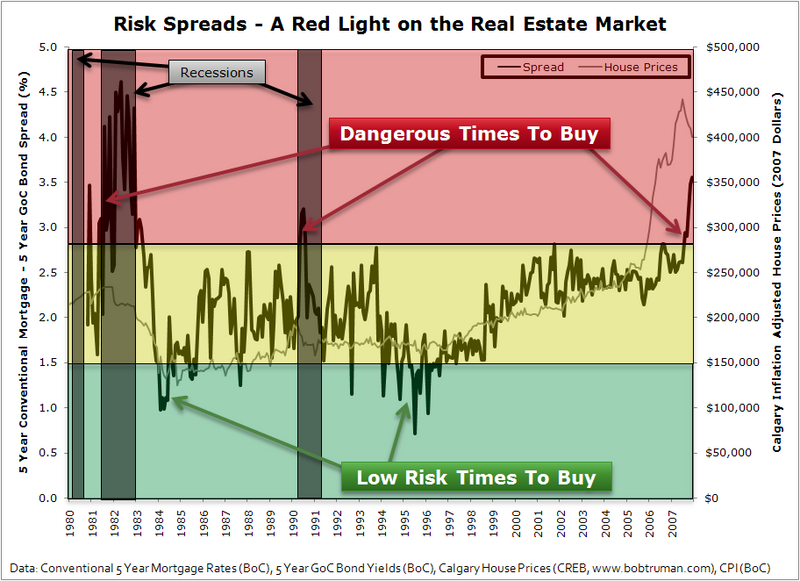 Posted by DustinRJay in Calgary real estate, risk spreads. Typically, when looking for a good investment opportunity, one expects a higher return than a safe investment like a bond. A mortgage product has risk and therefore should have a higher return than a bond. By an analysis of the spread above the safe investment vehichle one can determine periods of heightened risk in the credit markets. Typically, heightened risk in the credit markets has accompanied recessions. Also, this has proved to be one of several warning indicators for the peak in the housing market cycle. As you can see in the following graph, large jumps in the risk spread (red zone) have typically accompanied the start of a bear market in real estate. In addition, a recession has often followed a sharp increase in the risk spread. 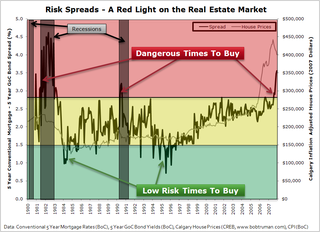 Currently, the risk spread is the highest it has been since the early 1980’s bear Calgary real estate market. This sort of analysis is useful in identifying some of the creamier investing opportunities (green zone) when the risks have been smaller. It seems that the posted 5-year mortgage rate is quite a bit higher than actual mortgage rates. For example RBC posted 5-year is 7.39%. Is anyone actual taking out a mortgage at these rates? Has there always been a spread this high between negotiated and posted rates. If not then the spread would be less than shown here. Also, two of the variables in this chart are Canada wide. Do you think it is a dangerous time to buy in ALL of Canada? I would say that it is likely to be a poor time to buy across all Canada. There is a high correlation between bull/bear trends across all cities in Canada. The major factor that affects house prices on a macro scale is interest rates. Regarding the question regarding historical spreads between posted and negotiated rates… I’m not sure as I’ve never seen any info about that before… My feeling is that as the negotiated rates are not readily available, there is probably little statistical information on the spread.